I’ve been thinking about this verse over the last few weeks and a question keeps drifting to the top of my thinking. 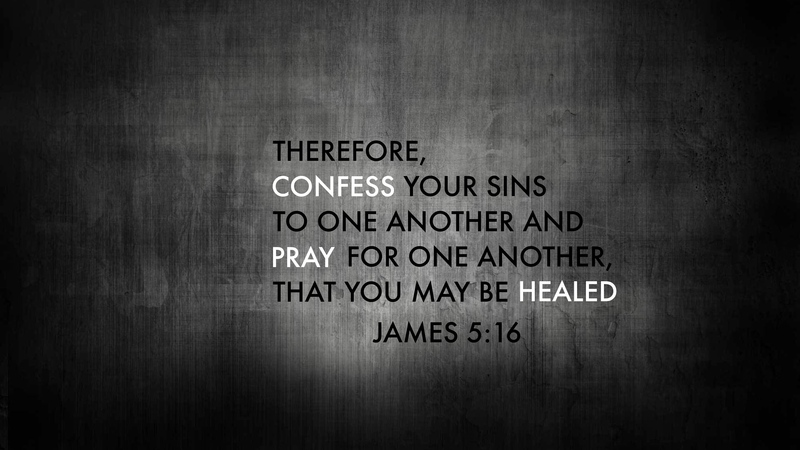 When we pray for each other God uses that obedience to accomplish His will in our healing. The question though hasn’t had anything to do with that part of the verse but rather the confession or accountability part. How does “confess(ing) your sins to one another…” add to that process of healing? This morning I was up early meditating on this and here’s what I’ve come to. If we’ll be honest with each other, confession embarrasses us. Sure we could use a more Christian term and say that it “humbles” us but what it feels like is just embarrassment. When I share with someone how I’ve sinned against God I feel and experience a type of shame. These aren’t happy things we’re talking about and they’re definitely not things that we should be thrilled to share with others. It seems, if that’s what it produces in me, maybe that’s what it’s for. Confession of sins one to another, I believe, is supposed to create that embarrassment. It’s designed by God to create in us that uneasy shameful feeling. Just a couple of days ago I had to confess twice to a brother over the course of five minutes. Once where I used generalities and made things oh-so-vague that I still felt less vulnerable. But then the second when I had to come back behind myself and “actually confess” what sin I committed and not leave it so nebulous. Confessing generalities of categories of sin––isn’t the same thing as confession of our sin. “I’m struggling with my thought life so please pray for me.” That doesn’t cut it. You see, confession reminds sin that there are consequences. When we’re tempted by our sinful desires and are being lead astray––sin either neglects to consider or just doesn’t care that there are ramifications to it’s actions. Temptation is so alluring because it boasts anonymity and freedom from any consequences. Sin promises to enrich our experiences and satisfy some longing or desire that we have. It makes that promise and is eerily quiet when the subject of consequence arises. When there’s no police car behind you, what the law has said is the maximum speed you’re allowed to drive doesn’t seem so rigid. So too confession places the police car in the rearview mirror. If I know that I’m going to give an account to someone or someones for my sins there is a reminder of consequence in the midst of temptation. Every time pride and arrogance creeps up in my heart I should make it my goal to share that with others that I might be healed. When that sin begin’s to boast a consequent-less pleasure then, my mind will rise up and clearly be able to crush that falsehood. However, sin is not merely indifferent toward consequences, sometimes it’s indignant. So we will still sin. Even with confession reminding sin of consequences, sin is willing to throw caution to the wind. This is why the apostle John said, “My little children, I am writing these things to you so that you may not sin. But if anyone does sin, we have an advocate with the Father, Jesus Christ the righteous.” So even if we do sin, even if we have already determined that we’re going to be open and honest with each other about our sin; When we sin, we know that if we’re in Christ He is our righteousness. When it’s time to come to each other and confess our hearts to one another, we then can do that in confidence feeling the embarrassment and the shame of our sin knowing that, “…for the joy that was set before him endured the cross, despising the shame, and is seated at the right hand of the throne of God.” (Hebrews 12:2) The embarrassment of confession can then be replaced by gratitude for Christ and intercession from each other. It feels shameful to sin, and rightly so. But the actual shame of our sin was dealt with on the cross of our Lord and Savior, Jesus the Christ.